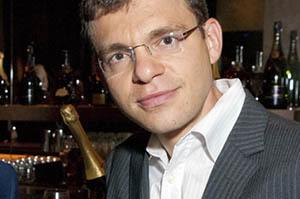 Max Levchin was the co-founder and CTO of Paypal, and founded Slide in 2004. He served as Slide’s CEO until the company was sold to Google in 2010, and left Google in the fall of 2011. He is also an investor in various startups, and is currently working on a new stealth-mode startup in the big data space. We wanted to hear what his plans for next year look like, and what kind of big trends he sees emerge. My mission for myself is to help the world make sense of data. We have gone from not knowing what’s going on around us to being able to record and track just about anything. Fifteen years ago, you had to go to a hospital to get your vital signs checked. I imagine that in five years from now, T-Shirts will have a sensor built in that will measure your blood pressure, and then transmit that information to your phone, and your phone will text you when your blood pressure is too high — no doctors or nurses involved, just a cloud service for health monitoring. The ubiquity of mobile devices, networks, bandwidth, cheap sensors and transmission, and cloud-based services, along with the liberation of information that was once thought of as very valuable and private and allowing it to live on a server as opposed to your personal desktop or phone — those are the pieces that will lead to exciting developments in a lot of industries, from health to transportation to energy. Sensors are generating lots of data to process, and the big data industry will benefit tremendously from all the new sources. I think the world will be enhanced and shaped by our understanding of data for the next 100 years, and I want to participate in bringing that about. My current startup will have a lot to do with the whole emerging big data movement. When I was analyzing what I wanted to do next, I realized I have always been really excited about data. At Paypal, I spent the majority of my time data mining — trying to understand the behavior of consumers and merchants, so that we could predict and appropriately price fraud. Being able to correctly price risk, transitions you from being a a regular payment startup to a profitable payment startup. At Slide, we built entertainment products. But again, I was excited about the behavioral data that we generated. And I have been investing in companies that deal with big data, such as Mixpanel, which is a data analytics company, and Kaggle, which is a data science talent marketplace. I left in Google around the beginning of October, because my ability to make an impact in a way that was both satisfying to me and useful to Google was waning. So this is the right time for me to reinvent myself again. I want to focus on taking bigger risks, to think bigger, aim higher, and build more long-term things. But I think there are plenty of things that can be explored and invested in. You just have to break out of the existing mind set. I think mobile is flipping from being a small, constrained window onto the Web to this cool new thing that’s finally living up to all those promises. Your phone or tablet is becoming a primary view on what’s going on, which is very powerful. Maybe by the end of next year, we will think of the Web as an unnecessarily large window into mobile. It will be thought of as a strictly desktop experience, what you do when you can’t stand up and move around. I think collaborative consumption is really great, too. Companies like AirBnB and Uber and all the different variants of that model are a sane, free market way of redistributing resources to those who need them the most and are willing to pay fair-market price for them. It basically brings access to people that haven’t had it before. At some point, somewhere, somebody is dying to get rid of an apple, and somebody is starving. Creating a cheap way of connecting those two people makes the world a better place. That’s a very exciting trend and there are a million little startups trying to build solutions for different verticals — for saving time, saving resources, saving gas, saving everything that can possibly be saved. I’m thrilled about that.